Dr. 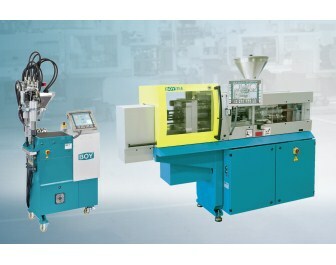 Boy GmbH & Co. KG will be represented by two injection molding machines at CHINAPLAS 2013. Along with a BOY 35 E equipped with the energy-efficient servo-drive, a two-component application will be shown. A two component application can be realized on any injection molding machine, says BOY. By using several injection units, multiple component production is possible. The flexible second injection unit is from the BOY XS and is equipped with its own hydraulic drive and Procan ALPHA control. Different sized injection units with plasticizing volumes up to a maximum of 64cm³ are available. The complete control and hydraulic unit is placed next to a basic machine. Wheels make the unit portable, so it can be easily moved and connected to other injection molding machines. Equipped with a servo-drive, which out performs conventional hydraulic drive systems in terms of efficiency, precision and quietness, the BOY 35 E will produce a polycarbonate (PC) watch housing. The four-tie bar machine with a clamping force of 350kN, a footprint of only 1.9m², and a cantilevered clamping unit, provides enough space for large molds. A lateral swivel-out injection unit, which reduces the changing times of the complete plasticizing unit, is another advantage of this machine.